UPDATE III: The "problem with politics in the age of searchable online news archives is that it’s the opposite of an Etch a Sketch: Nothing ever disappears." Read the Washington Post, Romney: For high gas prices before he was against them. UPDATE II: "U.S. energy policy has very little effect either on oil prices or on overall U.S. employment. For the truth is that we’re already having a hydrocarbon boom, with U.S. oil and gas production rising and U.S. fuel imports dropping. 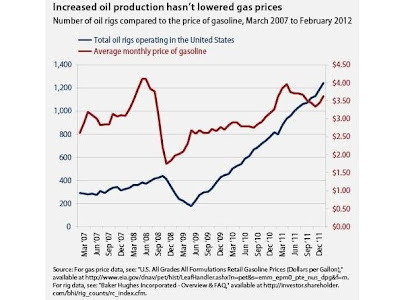 If there were any truth to drill-here-drill-now, this boom should have yielded substantially lower gasoline prices and lots of new jobs. Predictably, however, it has done neither. . .
Why, then, are Republicans pretending otherwise? Part of the answer is that the party is rewarding its benefactors: the oil and gas industry doesn’t create many jobs, but it does spend a lot of money on lobbying and campaign contributions. The rest of the answer is simply the fact that conservatives have no other job-creation ideas to offer." Read The New York Times, Natural Born Drillers. Actually the title of the article should be Natural Born Liars. UPDATE: "Who's to blame for gas prices now hovering near a national average of $3.80 a gallon? Take your pick: Iran, market speculators, oil companies, India. Yes. Already the fourth largest energy consumer in the world, India's demand for oil looks set to rise inexorably as more of its people buy cars and take to the road. Ditto for China and other emerging markets. Their rising demand is pushing up prices for everyone." Read the Christian Science Monitor, Gas prices too high. Blame India? "[O]il prices are set on a world market, and there are a whole bunch of factors that affect prices. A healthier global economy means more global demand for oil. That pushes prices up. A new wave of middle-class consumers in China and India have been replacing their bikes with automobiles. That pushes prices up. Oil fields are declining in countries like Mexico. That pushes prices up. Saudi Arabia seems to be running low on spare capacity. That pushes prices up. Tensions in Iran have prompted traders to set oil aside for potential supply disruptions in the future. That pushes prices up. America’s domestic oil production, by contrast, is a small part of the global picture. Dean Baker lays out some numbers: 'U.S. production is roughly 8 million barrels a day, it accounts for less than 9 percent of a world-wide market that is close to 90 million barrels a day. Even if U.S. production could be increased by a third (an almost impossible increase) it would only increase world supply by 3 percent. This would lower the price of oil by 7-8 percent. This is not trivial, but it is not the difference between $2 a gallon gas and $4 a gallon gas.' Yes, more drilling could allow us to reduce our oil-import bill, and that’s no small thing. 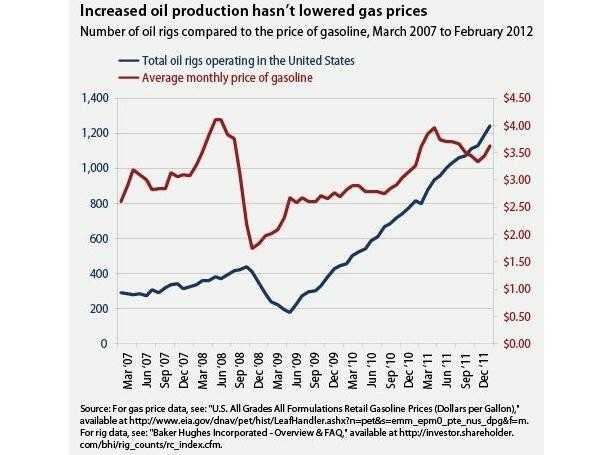 But drilling alone can’t bring back $2.50-per-gallon gasoline. By and large, though, the country’s main option is the hard, boring option — the United States could try to become less dependent on oil, so that rising prices aren’t quite as difficult to cope with." The best defense to rising oil prices, increasing efficiency (AKA conservation), which the Republi-CONs fight tooth and nail.